John Rafoth parlayed an 18-month project on a custom home 18 years ago into a successful electrical contractor business based in Canfield. Eighty percent of his business, he says, are repeat customers. “It was great training for me; great schooling all around,” he said. Each year he was assigned field work with a different local electrical contractor, and after topping out while working with Tri-Area Electric he accepted a position there. “I stayed with them eight or nine years and realized I was ready to make a go of it on my own,” he said. 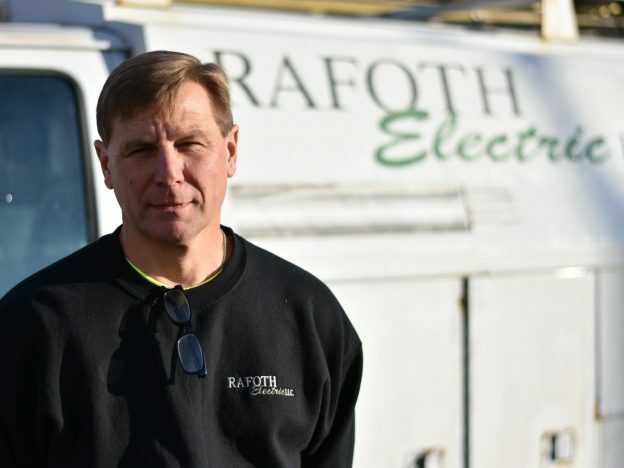 Affirming his entrepreneurial aspirations, a chance meeting with a friend of his brother’s in 2000 led to a job wiring a custom new construction home; an 18-month gig that would kickstart his new business, Rafoth Electric. When that project was done, a connection of his at Old North Church in Canfield hired him to wire a building addition there, which kept him busy for nine more months. And right after that he moved on to a job on a dormitory renovation at Kent State University. Thanks to positive word-of-mouth and a steady stream of work since then, Rafoth has made a successful business for himself. “I’ve been very fortunate, and that first customer of mine is still a customer today,” he said. Most of Rafoth’s work is commercial; specifically service work. Included in his fleet is a bucket truck that he uses for parking lot lighting maintenance, such as at the Southern Park Mall. He said 80 percent of his work is repeat customers. Rafoth Electric is part of the NECA-IBEW Electricians member contractors. Not only does he get value from being part of that organization with continuing education and code update opportunities, but he said it also adds credibility to his business.